We have over 600 cyclists (and their family and friends!) descending upon Moab March 10th - 13th. Consider creating a coupon or flyer for us to share with them in their event packet. 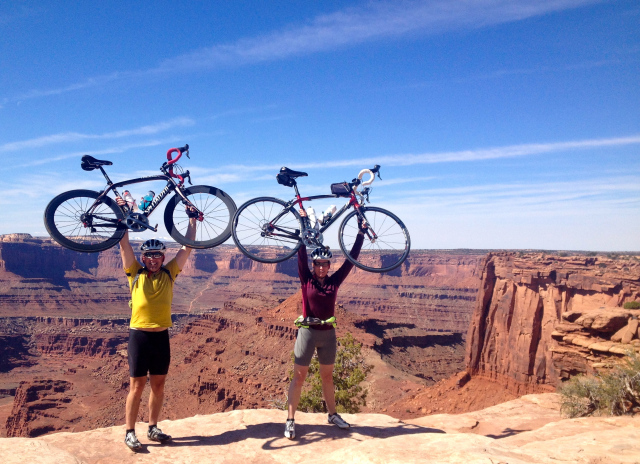 We have nothing to gain, other than trying to offer our riders the best experience in Moab as possible. Sharing as many great businesses and activities in town helps us achieve that goal. You do not need to include a coupon or a discount, but it is certainly encouraged. If you would like to include a flyer or coupon for your business in our packets, please fill out the form below. Please let us know by March 6th. You may contribute flyers for the packets (no larger than 8.5x11), flyers to be placed at registration table, or both. I would like my brand to be seen, I will do both! OPTIONAL - If you would like to donate 1 or 2 branded items (T-Shirt, Hat, etc) to our Rider Giveaway please choose "YES" below. We will be in touch to arrange a pick up. And Thanks! Thank you for contributing to our cyclist experience! We hope they come to visit your business while in town! Thank you for considering! These riders contribute to our community as well, as each one makes a minimum donation of $25 to the Cancer Treatment Infusion Room at the Moab Regional Hospital.